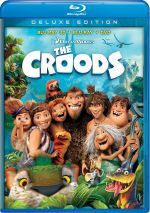 When their cave is destroyed, everything the Croods have ever known is rocked by seismic shifts and generational clashes as they discover an incredible new world filled with fantastic creatures. A surprise spring 2013 hit, The Croods takes us back to the caveman days. We meet the title family, a clan that includes father Grug (voiced by Nicolas Cage), mother Ugga (Catherine Keener), daughter Eep (Emma Stone), son Thunk (Clark Duke) and grandmother Gran (Cloris Leachman). Led by Grug, they live a cautious existence, as he teaches them to fear their dangerous world. That balance works nicely and gives the movie a broad feel that works for it. Given the nature of its prehistoric characters, one wouldn’t anticipate scorching verbal wit, but the film makes those integrate naturally with the slapstick. These two elements mesh in a satisfying manner without over-emphasis on one or the other. Jagged edges and shimmering remained absent, and only a smidgen of edge enhancement appeared. I also detected no source flaws. Croods provided a palette that featured a broad range of colors. It started with an amber feel but broadened as it went, so the movie offered a nice natural look with lively tones. I also felt very pleased with the DTS-HD 7.1 soundtrack of Croods. With stomping creatures and all sorts of action sequences, the movie boasted many opportunities to feature all five speakers, and it did so quite well. Various effects elements zoomed around the room to create a fine sense of immersion. The pieces meshed together smoothly and transitioned well. Audio quality also was very good. Speech seemed crisp and distinctive, as I noticed no flaws like edginess. Music seemed warm and full, while effects added a real bang to the proceedings. Those elements showed good clarity and accuracy, and they offered tight, deep bass as well. The track seemed vibrant and dynamic as it accentuated the movie. This set includes both 2D and 3D versions of Croods. The picture comments above reflected the 2D edition – how did the 3D compare? Quality-wise, sharpness and brightness took a minor hit. However, I didn’t discern anything notable, so the 3D version looked almost as great as its 2D counterpart. Stereo imaging worked nicely, as the movie brought a fine sense of depth and dimensionality. Various flying/floating elements hovered out of the screen, and a few fun “pop-out” action scenes contributed life as well. While I wouldn’t call this one of the great 3D presentations, the added visual impacr added to the film and will be my go-to version for future screenings. Under Croods’ Cuts, we find four “lost scenes”. Including introductions from writers/directors Chris Sanders and Kirk DeMicco, these fill a total of eight minutes, 20 seconds. Three of them come as storyreels, but “It’s a Great Cave” presents final animation. All are cute to see but not especially valuable. The disc opens with ads for Turbo, Shrek: The Musical and Epic. Sneak Peek also throws in clips for Percy Jackson: Sea of Monsters and a mix of “Holiday Favorites”. World of DreamWorks Animation promotes another batch of flicks, and we get the trailer for Croods as well. The 3D disc includes 3D versions of the Turbo and Epic promos. Though it reinvents no wheels, The Croods provides an enjoyable animated adventure. It comes with enough amusement and cleverness to turn into a likable piece. The Blu-ray boasts excellent picture and audio along with a mediocre set of supplements. The lack of substantial bonus features disappoints, but the movie merits a look, especially given the extra pizzazz afforded by the 3D version.